Love it. 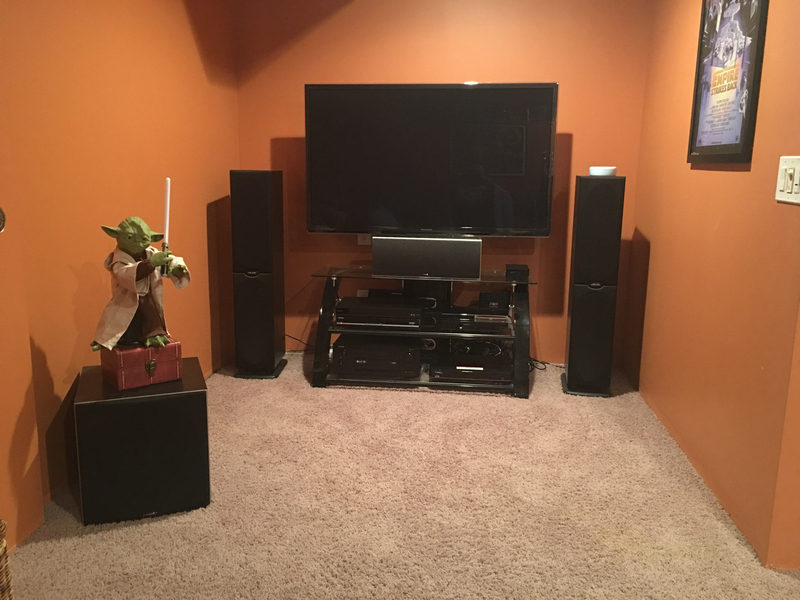 My system has not been hooked up yet in the new house (basement)! Lots of other remodeling projects going on, and sneaking in my 2-channel rig transformation! I hear ya about sneakin something in. Done it a few times myself. When I auditioned the RT3000P ( Only one had an amplifier ) in a Pawn Shop, Gloria Estefan's "The Rhythm is Gonna Getcha" came on the radio. I felt the concrete floor vibrate, seriously. I smiled, my wife smiled and she knew right then, I wanted them. I called Polk customer service a day or three later and got 2 new amps. I later tested a new "yard sale find" receiver with them. I think I moved the balance dial and BAMMMM. A heck of a short! Thank God only one tweeter blew. That's why one of mine is grey. It sounded like a bomb blew up in the house. It freaked me and my wife out bad! I still have a mint RT2000p/CS1000p set in my workout room. I had front and rear 2000’s for years in my theater room. I just can’t let them go. I almost did the 3000s back in the day and wished I had for years. Sad your a 2 day drive. The 3000s and 2000s can be perfect for movies once set up right. The CS1000p is still the best center I have heard. I think that’s why I waited 16 years to upgrade my theater speakers. Someone please get and enjoy this setup. Would you be willing to sell just the center? I live in St. Peter’s so I could pick it up. Would love the 3000’s but my room is just not big enough. I have had the 1000i powered towers I bought new in 2001 so this center would be a great match. Hmm, it's not my preference but send me a PM to discuss further. Final bump before this goes to craigslist. I still have the CS1000p but I plan to keep that for now. Hey! Foothills of NC! I'm your neighbor! You might want to edit out your phone number. This is an open public forum. Safety first! Since you quoted his post even if he edits his the phone number stays. Mr. Swauger to the rescue!!!! All speakers in this post have been SOLD. Sorry I forgot to update it a while back. No problem. I knew it was a bit of a long shot since it’s been a few months. This is a very hard set to find!